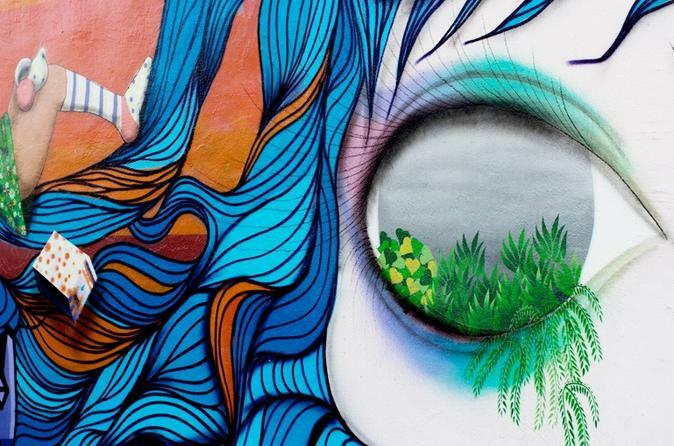 Get to know the artistic spirit of Miami's Wynwood neighborhood during this 1.5-hour walking tour focused on the area's collection of street art. Meet your guide at an outdoor bar and sip an included drink while listening to an orientation, then stroll through the surrounding streets to see the murals and graffiti art. Learn about the artists who created the works, their techniques and the works' meanings. Meet your guide at an outdoor bar in the bustling neighborhood of Wynwood. Sit down with your guide and group for a complimentary welcome drink, relaxing for about half an hour as you learn about the area. Revel in the casual atmosphere of the brick patio and hear a little bit about the art you're about to see. Embark on your 1-hour walking tour of the Wynwood Art District, learning about the history of the neighborhood as you stroll. Admire the raw energy and obvious emotions that have gone into creating some of the vibrant murals. Listen as your guide explains the techniques and contributions of artists such as Os Gemeos, Kashink and others. Specific graffiti art works and murals are subject to change, as they are frequently painted over and replaced.